Seminar Series 2018 – Darío J. Stacchiola, Ph.D.
Home All Events Seminar Series 2018 – Darío J. Stacchiola, Ph.D.
Heterogeneous catalysts undergo dramatic changes in their structure as they mediate a chemical reaction. Multiple experimental approaches have been developed to understand these changes. Due to the complexity of the materials used as heterogeneous catalysts, and the difficulty of interrogating them under reaction conditions, catalysts are generally characterized only before and after chemical reactions. Thus, the dynamic active phases formed in catalysts under reaction conditions, which generate nanometer sized multifunctional active centers at metal/oxide/modifiers interfaces, and the associated reaction mechanisms are unknown. Since the structure of catalysts change as reacting molecules interact with it in route to forming products, only in-situ techniques allow following the dynamic processes involved on the surface of a catalyst. But interrogating these special interfacial sites experimentally is challenging. There has been considerable progress in the development and use of surface science techniques to follow catalytic reactions in-situ. Photon-in/photon-out techniques, such as IR spectroscopy, were used early on but photo-electron spectroscopic techniques, where electrons interact strongly with the reactants in the gas phase, took much longer to become widely available. Electron based structural techniques, such as scanning tunneling microscopy (STM), are still only available on a limited number of laboratories. I will present case studies showing how complementary in situ techniques including ambient pressure (AP) X-ray photoelectron spectroscopy (AP-XPS), infrared reflection absorption spectroscopy (AP-IRRAS) and AP-STM can be applied to study heterogeneous interfaces in model catalysts. 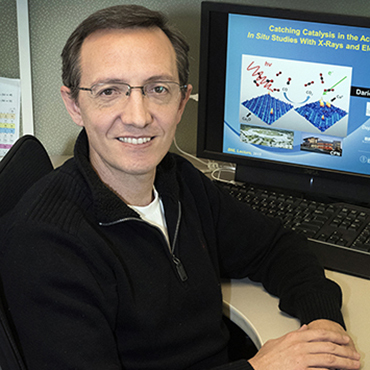 Dr. Stacchiola is the Interface Science and Catalysis Group Leader at the Center for Functional Nanomaterials-Brookhaven National Laboratory (CFN-BNL) and Adjunct Professor at Stony Brook University. He obtained his B.S. degree (1997) at UNSL (Argentina), his Ph.D. (2002) at the University of Wisconsin Milwaukee and was a Humboldt Research Fellow at the Fritz-Haber-Institute in Berlin (2005−2007). His research focuses in surface chemistry studies by in-situ tools, and in particular on structure–reactivity relationships in catalysis. The use of well-defined model catalysts allows the characterization of systems at the molecular and atomic level. Studies of these model catalysts by complimentary in-situ ambient pressure spectroscopy and microscopy gives direct evidence of dynamically generated active phases and adsorbed surface species, which are produced or stabilized only under reaction conditions. He is the author of over 150 peer-reviewed publications.